Our Fabric Reinforced Roofing System covers your roof with a seamless coat of protection and eliminates leaking! A fabric-reinforced system combines the leak-resistant seamless membrane of a liquid-applied system with the toughness and tensile strength of a single-ply fabric system. The reinforcing fabric gives extra strength to the finished watertight coating membrane without adding significant weight. With its reflective, energy-saving white top coat, your finished system stands up against tough weather and offers strong long-lasting protection. Our system provides an interlocking impermeable waterproofing. Elastomeric layers are elastic and will stretch, not crack and leak like other roofing. Once a restored roof reaches end of duty cycle it can usually be brought back by simple recoating. No need to tear off and dispose of existing roofing. Keep cool and save some green. White acrylic coatings revolutionized the commercial roofing industry over thirty years ago. 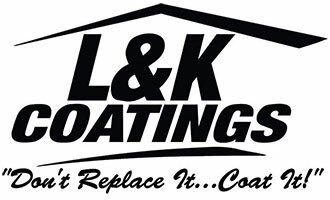 L & K Coatings LLC focuses on the obvious: white roof surfaces reflect more of the sun’s heat rays than darker roofs do. A white roof will naturally be cooler and can save Iowa commercial and industrial building owners up to 30 percent in cooling costs annually. These Energy Star-rated roof coatings are more popular than ever as building owners look for ways to reduce rising energy costs. - Total Cost of Ownership over time is lowest of all comparable Roofing Systems. - Roof Coating Matrix is elastic and bonded to the roofing structure, eliminating cracking, leaking, and decay. - Weather and wind resistant . - Does not add significant weight to your building. - All the topcoats we use are white and more reflective than aluminum – they reflect 85% of solar radiation, cutting air conditioning costs significantly – by up to 40% or more.